I think it's mostly because I have found myself in some situations, recently, work and personal, that have pushed me outside of my comfort zone and I've had no choice but to swallow any anxiety and truck through it. What you are seeing is right. This woman's name is Bettina Eistel and not only does she have no arms, she also competes (very successfully, I might add!) at high levels of competition, has medaled at the Paralympics and has won championships in Germany and Belgium. I'm sorry, but this lady is amazing. What I find the most impressive, actually, is something that the numerous other bloggers and articles haven't mentioned. 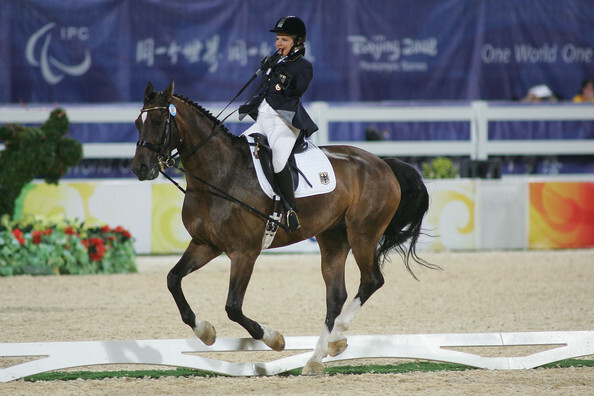 This woman was born without arms, so it is not like she once had a great love and talent for horses and then lost her arms and found a way around it - no - she endeavored to ride without arms from the very beginning. But not only does she ride, she also tacks up, hoses down, brushes, blankets, wraps, etc -- nothing short of incredible! Her horse's name is Fabuleax 5 and he looks like he is one heck of a horse - not only talented but also one of those "considerate" horses who just seems to "know". Looking at all of this, I thought to myself "What kind of courage must it take to go out there, physically handicapped and not fitting a "rider" stereotype? What kind of challenges does she face socially in addition to physically?" Everyone knows it takes some courage to get on a horse in the first place. If you're like me and you've been doing it forever, that fear is foolishly not present most of the time - but occasionally thoughts do cross my mind - what if I fall? What if I am horribly injured? What if I'm hurt so badly that I am never able to ride again? I'm sure many of those same thoughts cross the minds of both plus and average sized riders across the world every time that they saddle up. I mean, if you're smart, those kinds of thoughts are present! You are, afterall, settling onto a 1200+lb animal who has a mind of its own and a spring-loaded ejection seat like those cars you see in the cartoons. Imagine not having arms to break or cushion your fall, or give you leverage to get your horse under control. I think many of us, even though we pack around a few extra pounds, are fortunate, and I think we need to take advantage of that and use it to our best potential. It might take a big shot of courage, a friend to give you the confidence you require, or a visit to our forum to find support and encouragement, but I guarantee - if Bettina can do it, so can we.